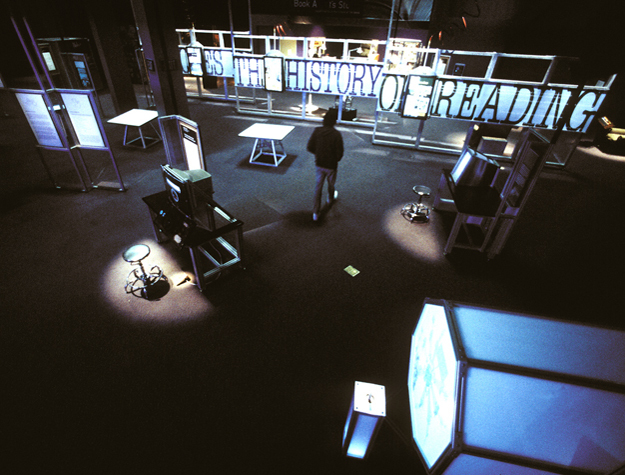 For the Tech Museum of Innovation in San Jose, California, the Onomy Labs principals, then as researchers at Xerox PARC and members of a larger group called Research on Experimental Documents (RED), designed and constructed a 15-exhibit show entitled eXperiments in the Future of Reading, or XFR, sponsored by Xerox Corporation. Our purpose for building the exhibition was to communicate two important messages to our visitors: that technology will change the way we read, and that these changes could be extremely exciting. Because we wanted the interfaces to be as intuitive as books already are, we decided to eliminate all visible keyboards or mice and instead build interactors that children would be comfortable with. Since we were building new reading devices that suggested new genres of reading, we needed to author a new kind of content for them. Museum visitors look for exhibits that are both entertaining and thoughtful, and we were successful on almost all levels in achieving that with XFR. The hundreds of thousands of children who experienced our devices and actually stayed to read the content have been delighted with the interaction. The XFR Reading Wall won a Gold Award from ID Magazine, and the Listen Reader won a Silver Award. The XFR exhibition completed a three year tour of science museums in North America and was later retired.